Racing pundit George McDonagh casts a learned eye over the horses he thinks will make the news at Ballybrit next week. 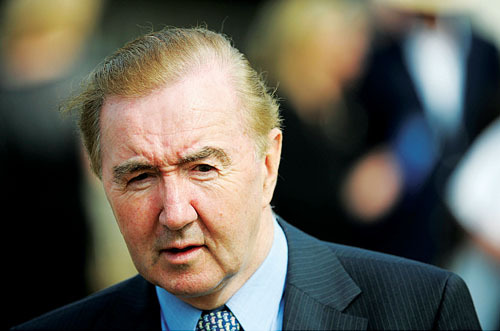 Will Dermot Weld maintain his excellent record in Ballybrit? Well readers, the 2008 Galway Races are virtually upon us and with the prophets of doom and gloom working overtime for the last two months this year’s festival has taken on the role as a barometer of the country’s financial state as well as being the top racing festival in the fair island of ours. It is true that ‘the tent’ is gone but there were plenty of people queueing up to the place of the ''Bertie Bash'' including the county football and hurling boards so the locals will have chance a plenty to enjoy the corporate entertainment at Ballybrit this week. Despite the much publicised economic downturn every one of the 51 races at the festival will have a titled sponsor which is of great credit to John Maloney and his team at the track. The twin features as always are the two early closing races, the William Hill Galway Plate on the Wednesday and the Guinness Galway Hurdle on Thursday which of course is also Ladies Day. The €144,000 added William Hill Galway Plate is this year not numerically as strong in entries as other years but there is most definitely a quality look about those at the top of the handicap. The burden of top weight of 11st 10lbs has this year been allotted to the Paul Nicholls trained Hoo La Balloo, the likely mount of the reigning Irish champion jockey Ruby Walsh has some top class form on his CV. Still only a seven-year-old the son of Unfuwain was travelling ominously well in last year’s renewal when he was brought down six from home just as Ruby had asked him to take closer order — although they still had almost a mile to travel, WE only had to see the look on Ruby's face when he came back to the parade ring to meet his trainer to realise that this was one that got away. Since then he has added to his tally by winning twice when successfully beating Blue Superbe under amateur Nick Scholfield at Kempton Park and then proving too strong for Magic Sky and subsequent Cheltenham festival winner Tiger Cry at Ascot in November under Liam Heard. That contest was over the minimum trip of two miles which in my opinion cast doubts over his ability to last the testing 22 furlong trip but you then must fathom in the fact that he finished third behind Monkerhostin in the Bet365 Gold Cup at Sandown over three miles and five furlongs. The fact of the matter is though that he was given a superb ride by Walsh that day just creeping in to the contest slowly from the rear until the stamina question raised its head racing to the final fence. The Master of Ditcheat also looks set to be represented by the progressive six year old Oslot — a six-time winning six-year-old and the Jim Lewis owned Oumayade who may be a slight doubt having disappointed when a well backed favourite in the Tote Summer Plate at Market Rasen last Saturday. Another cross channel contender could be the Mark Rimell trained Crossbow Creek who is another that might struggle on the climb from the final fence. The home defence will be a strong one with the two time winner and Plate regular Ansar the highest weighted runner on 11st who sees himself 17lbs better off with the top weighted Hoo La Baloo this time round, despite the fact that Dermot Weld's course specialist is now 12 years old. He shaped with promise in a flat handicap at the Curragh on Oaks Day behind Flashy Beau.The key to Ansar’s chances lie in the underfoot conditions, as genuinely fast ground will see him there with every chance turning down the hill and relatively speaking he has little mileage on the clock for one of his age — but what a possible swansong it would be to see hime triumph once again. For me though the main contenders for overall honours are the John O'Shea-trained Santa’s Son a good winner at Roscommon earlier this year under top weight from Nassaro with last year's Plate sixth Oodachee behind. In that contest he made all the running under John Cullen, jumping well in the main before staying on well from the final fence, and he then warmed up for the task at hand with a run on the flat at Killarney behind Mountain Snow. Off a weight of 10st 9lbs he looks to me to have been prepared all year with the Plate in mind. The other one that interests me is another Plate, regular the Niall Madden-trained Ursumman the son of Leading Counsel had run with credit in the last three runnings of the Plate including a good second to Ansar three years ago. But the sneaking suspicion in that he barely gets the trip of two and threequarter lengths so ground conditions are so important to his chance as the faster the better is the requirement here. This year Ursumman has had just two outings over fences that last being an OK effort behind Dbest at Punchestown in late May. It may be that he runs best when fresh so that lack of a recent outing should not inhibit the chances of this very slick and economical jumper but the one fear is that the climb from the final fence in the dip will tax his stamina and a place in the frame might be his only reward. Others that will have their supporters are the Tony Martin-trained Green Mile who had been the subject of good market support following a win over hurdles at Killarney last week but he may lack experience for the task in hand; and Piano Star, a battling winner of the Midlands National at Kilbeggan for Athenry owner John Kelly; plus last year’s second and third Ballyagran and Cool Running but for me it's Santa’s Son to hopefully bring Christmas in July for us punters. The Galway Hurdle Picture to me is probably as wide open a contest for the Thursday feature as there has been for years. With original top-weight Accordian Etoile recently retired, the burden of top weight looks likely to be shouldered by the Tom Hogan-trained Kalderon who although quite consistent in both handicap and conditions races doesn't to me look capable of giving weight all round in this ultra tough contest. The potential class horse of the race is the Dermot Weld-trained Majestic Concorde a winner on the level at Killarney the son of Definite Article whose progeny have a distinct preference for fast ground ran with credit last winter in good company when ground conditions would not have suited especially at Chelthenham behind Fiveforthree where although finishing only 12th he was eased considerably once his chance had gone at the second last. He will be a couple of points shorter in the market than he should be, being trained by the master of Rosewell House. King Rama, trained in Waterford by John Kiely, is also close to the top of the market having landed the odds in a couple of soft handicap hurdles at Sligo and Killbeggan earlier in the summer when he exploited a very lenient handicap mark. He has plenty of form to his credit in top notch flat handicaps but whether he can handle the pace in a race of this quality to me is questionable, as his jumping will come under severe pressure. Others that will no doubt be involved at the business end of the contest will be the Tony Martin-trained pair Northern Alliance and last year’s course winner Leg Spinner, Roman Villa from Grand National-winning trainer Gordon Elliott's yard, the ultra consistant Eagle’s Pass, and last years runner up Freeloader trained across the water by Richard Fahey. In my opinion the best value to be had lies with a horse who was most unlucky in the corresponding race three years ago when a well supported 13/2 favourite he tipped up at the second last in the race won by More Rainbows. The horse in question is the Noel Meade-trained eight year old Definite Spectacle who warmed up for the task at hand with a fine second behind Larkwing in the Grimes Hurdle at Tipperary on Sunday last where among others the well touted Megan’s Joy was behind. Definite Spectacle has a telling turn of pace and although his attitude has often been questioned with his high head carriage, his telling turn of foot can be exploited on the run in. Currently trading at about 20/1 in the ante post market the price is most appealing and I think he will certainly give us a run for our money. Others who may well be in the front line rising that famous climb for the second time are Lyceum, Quinnmaster and the Tom Foley-trained Dariak. With entries for other feature events still not to hand at the time of writing it is quite hard to assess these contests but in the Tote Mile on Tuesday I think that the Dermot Weld-trained Absolute Image may well finally taste success in a contest that he had finished both third and second in in the past two years. He clearly acts on the track and it just could be a case of third time lucky for the usually blinkered grey. Though if it's a banker you want for next week look no further than the Weld-trained Designated Decoy in one of the three-year-old maidens. Others that if they take part deserve a second glance are the Willie Mullins-trained Mountain Snow, a winner and who has performed with great credit in his previous efforts at the festival; Carlessimo from the Noel Meade yard who has regained his confidence with winning a Wexford claimer three weeks back while local trained Val O'Brien's yard have seen a mini revival in their fortunes of late.